279 Newbury (35 Gloucester) is located on the NE corner of Gloucester and Newbury, with 33 Gloucester to the north, 282 Newbury to the south, across Newbury, 275 Newbury to the east, and 36 Gloucester (279-A Newbury) to the west, across Gloucester. 279 Newbury (35 Gloucester) was designed by architect Samuel D. Kelley and built in 1882-1883 by Samuel Tarbell Ames, builder, for Charles Anthony Morss, a wire and cable manufacturer. It was one of four contiguous houses (29-31-33 Gloucester and 279 Newbury) built for Charles Morss for speculative sale. He and his wife, Mary Elizabeth (Wells) Morss , lived at 323 Marlborough. Click here for an index to the deeds for 279 Newbury (35 Gloucester). Although it appears as both 279 Newbury and 35 Gloucester on the earlier Bromley maps and in other records, the entrance was always on Newbury and 279 Newbury was the address published in both the Blue Books and City Directories from the time the house was first occupied. The entrance on Newbury was designed with the same stone lintel as was used at 29-31-33 Gloucester. On December 1, 1882, 279 Newbury was purchased from Charles Morss by Roxana (Stackpole) Dabney, the widow of Frederic Dabney. She lived at 411 Beacon. 279 Newbury became the home of her son and daughter-in-law, Frederick Dabney, Jr., and Isabelle (Guillou) Vezin Dabney, who had married in November of 1882. Prior to their marriage, Frederick Dabney had lived at 411 Beacon with his mother. He was an attorney. On March 24, 1884, Roxana Dabney transferred the property to her son. Frederick and Isabelle Dabney moved soon thereafter to New York City, where he became a wholesale dealer in lamps. He later resumed the practice of law. On April 1, 1884, 279 Newbury was acquired from Frederick Dabney by John Oscar Teele, an attorney. He and his wife, Mary Page (Smith) Teele, made it their home. They previously had lived at 137 Pembroke. They continued to live at 279 Newbury during the 1897-1898 season, but had moved thereafter to Waltham. 279 Newbury was not listed in the 1899 Blue Book. On April 1, 1899, 279 Newbury was acquired from John Teele by Arabel (Morton) Goodspeed, the wife of Joseph Horace Goodspeed. They previously had lived in an apartment at 382 Commonwealth. Joseph Goodspeed was comptroller of the Boston Elevated Railway Company and then treasurer of the Massachusetts Electric Companies, which owned a number of street railway systems in Massachusetts. The Goodspeeds continued to live at 279 Newbury during the 1923-1924 winter season, but moved thereafter to the Hotel Vendôme. On April 14, 1925, 279 Newbury was acquired from Arabel Goodspeed by real estate dealer William J. Stober. On October 16, 1925, 279 Newbury was acquired from William Stober by Edith E, (Lawrence) Cooke, the wife of Leonard Hatch Cooke, a clerk at Young’s Hotel. They lived in Dorchester. In November of 1925, she filed for permission to convert the property from a single family dwelling into a tea room and lodging house. She abandoned the application but apparently proceeded to operate a lodging house nevertheless, and was cited on February 12, 1926, for failing to get the necessary legal approvals. On December 9, 1925, Edith Cooke transferred 279 Newbury into her husband’s name. On April 8, 1926, 279 Newbury was acquired from Leonard Cooke by Joseph Hinton Leddy, an attorney with offices at 45 Newbury. He advised the Building Department that he would make the necessary improvements to bring the property into compliance with the law. On May 31, 1927, 279 Newbury was acquired from Joseph Leddy by John H. Roth. In May of 1930, he applied for (and subsequently received) permission to remodel the interior, indicating that the current and proposed use was as a single-family dwelling. Notwithstanding this application, the space was used for various commercial purposes from 1930 (and probably before). In 1930, it was the location of the New-Glo Restaurant, and from 1931 to 1933 it was the School of Ageless Wisdom. It appears likely that it also operated as a lodging house. 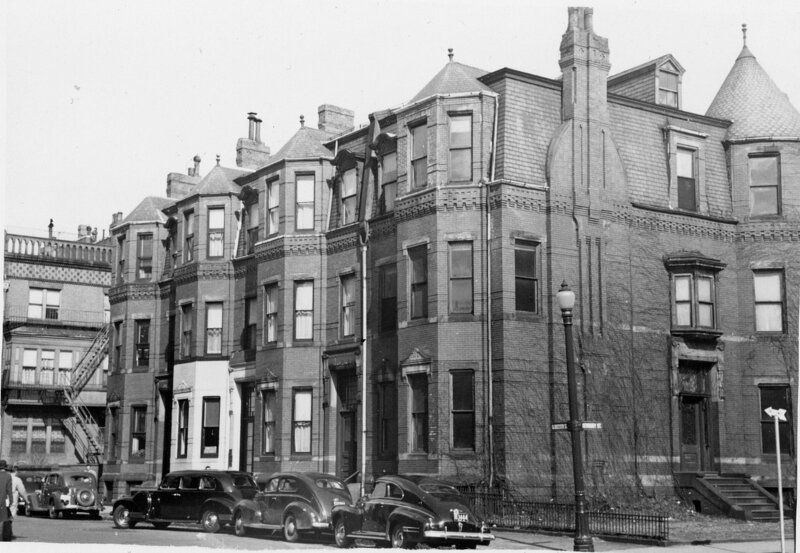 In 1933, John Roth applied to convert the property into an apartment house, increasing the height two stories to a height of 73 feet, and adding a 20′ x 23′ extension on 279 Newbury’s side yard between it and 275 Newbury, with the height conforming to the proposed new height of the original building on Newbury Street. The modifications were approved by the Board of Appeal on May 11, 1933, but the work was not undertaken. In 1934, 279 Newbury was the location of the Hub Research Corporation, dealing in patents and novelties, and in 1935, it was The Book Shelf. From 1936 through 1939, 279 was shown as vacant in the City Directories and was not listed in the Boston Lists of Residents. On June 5, 1939, Nora (McCarthy) Bowen, wife of John Bowen, holder of a mortgage given by Edith Cooke and assumed by subsequent owners, foreclosed and sold 279 Newbury to the Newbury Realty Company, of which her son, John Florence Bowen, was president and her son, Charles E. Bowen, was treasurer. The Bowens were building contractors and lived in Quincy. 279 continued to be shown as vacant in the 1940-1949 City Directories and to be omitted from the Boston Lists of Residents. 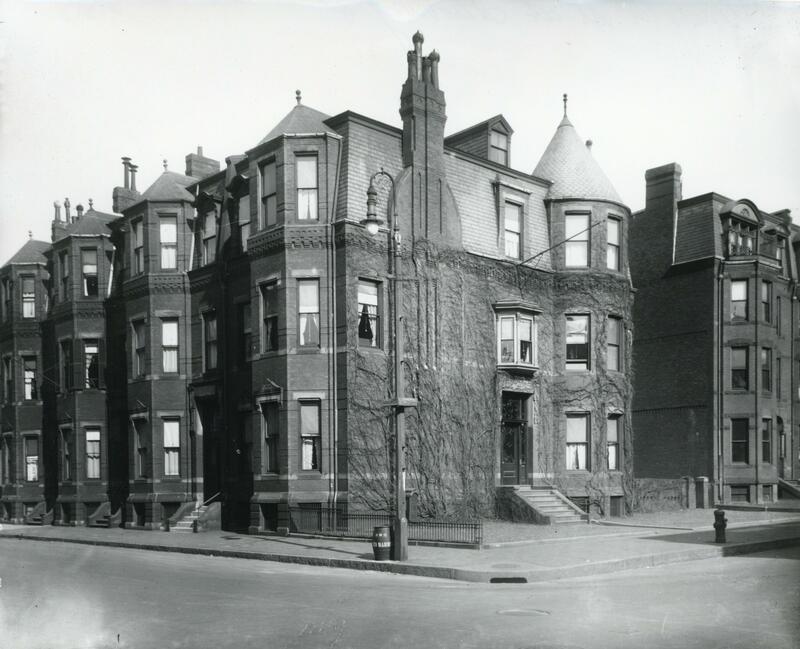 On April 5, 1949, 279 Newbury was acquired from the Newbury Realty Co. by Shirley Clifford Speed, a real estate dealer who converted many Back Bay houses into lodging houses and apartments. 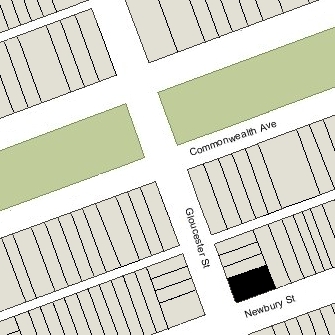 On May 20, 1949, 279 Newbury was acquired from S. Clifford Speed by the Gerald Company (Nathaniel Ramin, treasurer). From 1950, 279 Newbury was occupied by several residents, offices, and commercial enterprises. 279 Newbury continued to be owned by the Gerald Company until July of 1979, when the property changed hands and, on November 6, 1979, was purchased by Suzanne Safar, trustee of the Jean-Pierre-Gaston-Serge Realty Trust. 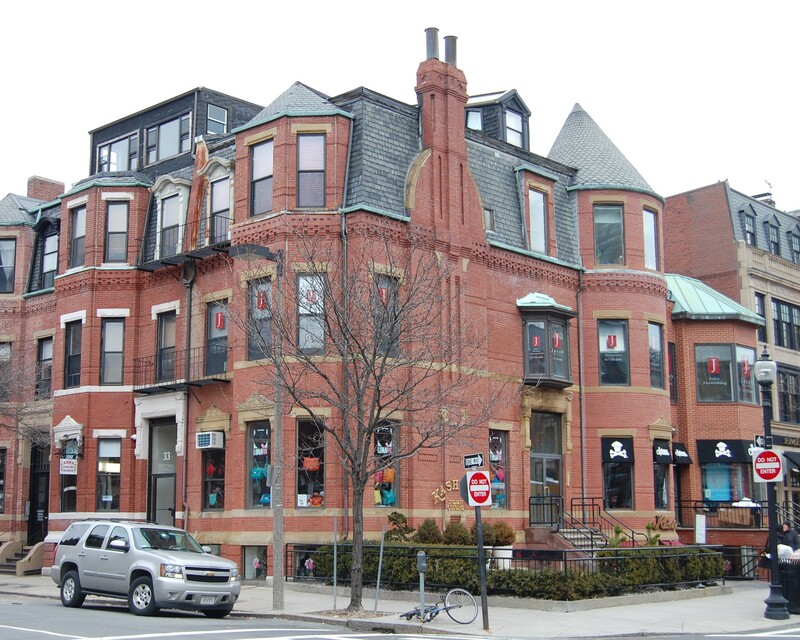 In March of 1981, Suzanne Safar applied for (and subsequently received) permission to construct a 25′ x 20′ extension in the space between 279 and 275 Newbury. In October of 1984, she acquired 33 Gloucester. In December of 1985, the Gaston Serge Realty Trust filed for (and subsequently received) permission to combine 33 Gloucester and 279 Newbury into one property. The properties continued to be occupied as a combination of apartments, retail stores, and restaurants. 33-35 Gloucester (279 Newbury) remained a mixed residential and commercial building in 2017.